Behind March On Washington's 'Sunny Reputation,' A Deep Fear Even though the March on Washington was nonviolent, many braced for riots. Host Michel Martin speaks with Pulitzer Prize-winning historian Taylor Branch about the story behind the march. NPR coverage of the March on Washington, one of the hallmark events of the civil rights movement. 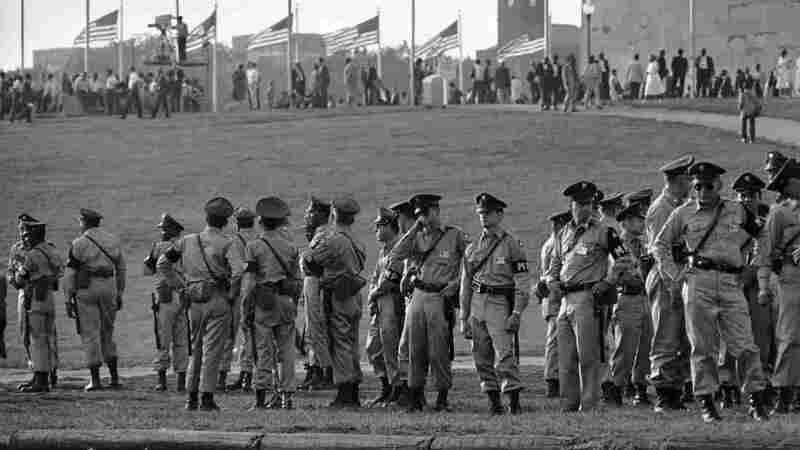 Army military policemen line up on the grounds of the Washington Monument for duty during the 1963 March on Washington. The 1963 March on Washington didn't happen in a vacuum. Many racial demonstrations before that year — from the Freedom Rides to lunch counter sit-ins — had been met with horrific violence. So when an estimated 250,000 descended on the nation's capital, "Washington was terrified," Pulitzer Prize-winning historian Taylor Branch tells Tell Me More host Michel Martin. 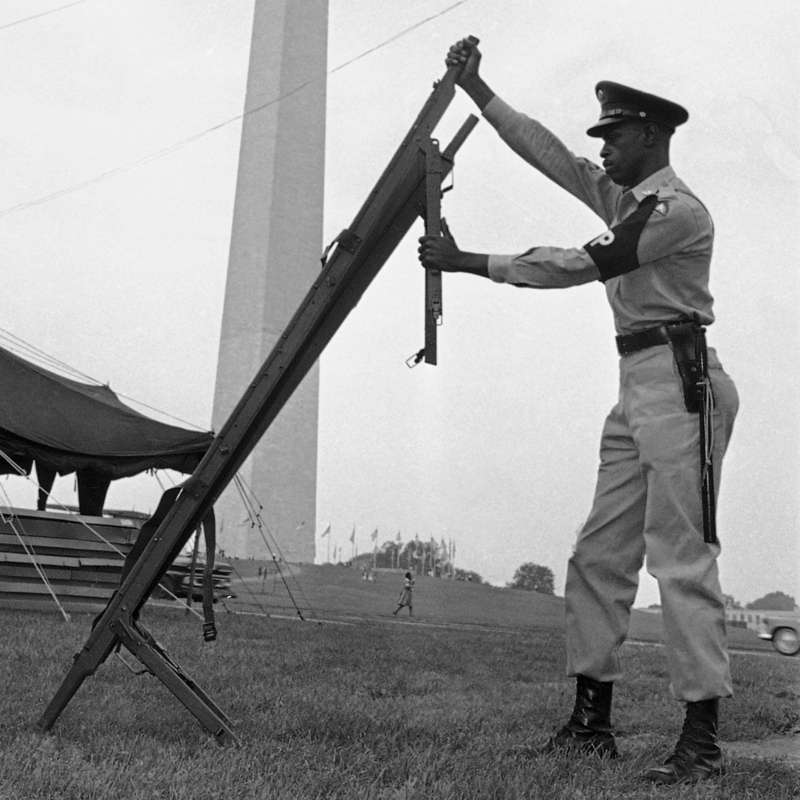 National Guardsman Burton Johnson set up a cot at a first aid station ahead of the March on Washington. "One of the reasons the March on Washington has such a sunny reputation in history is because there was such a sharp contrast — people were so relieved compared with what they expected. Official Washington was terrified of this march. They tried to stop it. They canceled liquor sales for the first time since Prohibition. They canceled elective surgery in all the hospitals, they stockpiled plasma. ... Life magazine said the capital had the worst case of pre-invasion jitters since before the first Battle of Bull Run before the Civil War." "A lot of people were reluctant to share their true feelings about it. They knew it went deep, but it was a risk to talk about it. It was a period in time when people got sweaty palms if they were in any mixed room. Not just because they were afraid of the police or of the Klan, but because everybody's parents were involved in businesses and you never knew. ... People were hiding and crouched in a lot of psychological corners." "I was at football camp in South Georgia. I was a high school student. And I had just resolved to myself that when I got really secure and old, maybe 30, that I might stick my toe in this scary thing called race relations that had plagued my whole formative years in segregationist Atlanta. I wanted to get involved and then I turn around and see little 6-year-old girls marching into dogs and fire hoses. It just stunned me. I said 'They're not waiting until they're 30 years old.' "